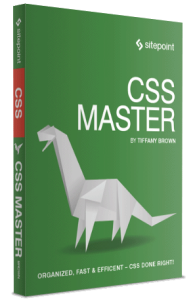 The following is an extract from our book, CSS Master, written by Tiffany B. Brown. Copies are sold in stores worldwide, or you can buy it in ebook form here. 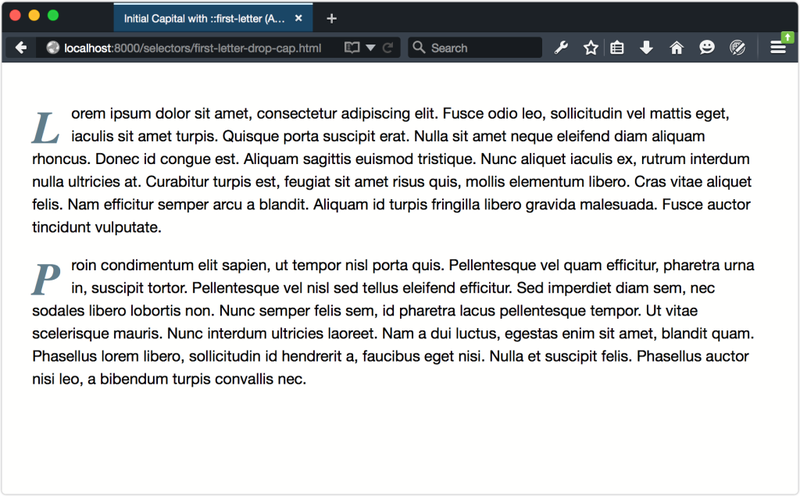 Of these, ::first–letter, ::first–line, and ::selection affect content that’s part of the document source. The ::before and ::after pseudo-elements, on the other hand, inject content into a document without it existing in the document source. Let’s look at each of these pseudo-elements more closely. 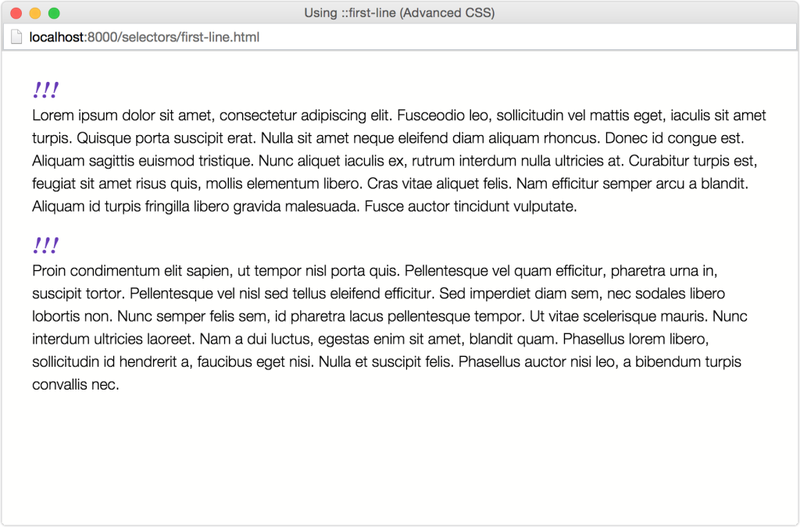 You may come across single-colon versions of ::first–letter, ::first–line, ::before, and ::after in old CSS. These pseudo-elements were defined in CSS2 with a single :. Though Internet Explorer 8 requires single-colon syntax, most other browsers support both versions. It is recommeded to use the double-colon syntax. 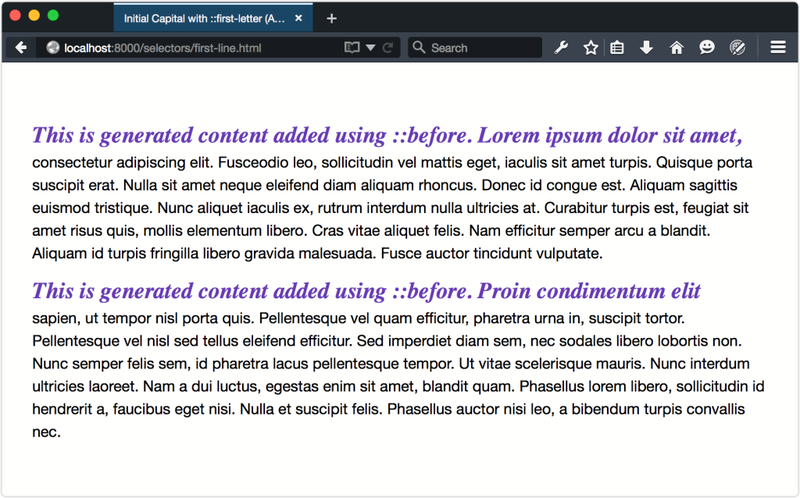 Most pseudo-elements allow us to select content that’s already part of the document source—in other words, the HTML you authored—but not specified by the language. With ::before and ::after, however, matters work differently. These pseudo-elements add generated content to the document tree. This content does not exist in the HTML source, but it is available visually. 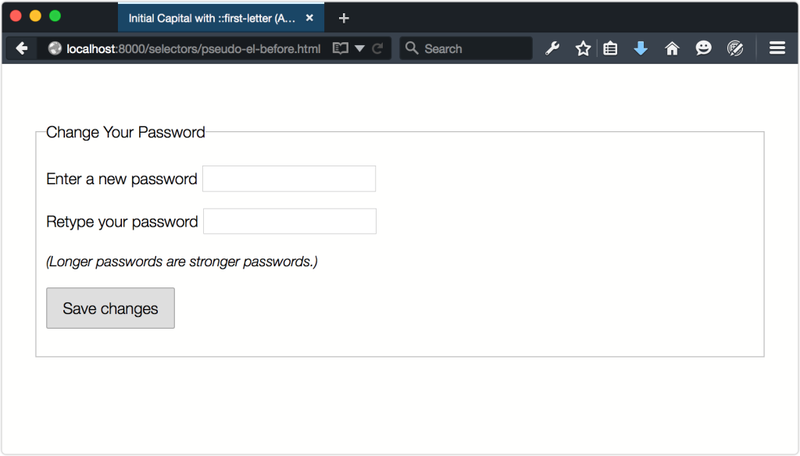 Required form fields use the required HTML property. Since that information is already available to the DOM, using ::before or ::after to add helper text is supplemental. It isn’t critical content, so it’s okay that it’s not part of the document source. Add the clearfix class to any element that needs to be cleared after a floated element. Both ::before and ::after behave just like regular descendants of the element to which they’re attached. They inherit all inheritable properties of their parent, and sit within the box created by their parent. But they also interact with other element boxes as though they were true elements. Adding display: block or display: table to ::before or ::after works the same way as it does for other elements. 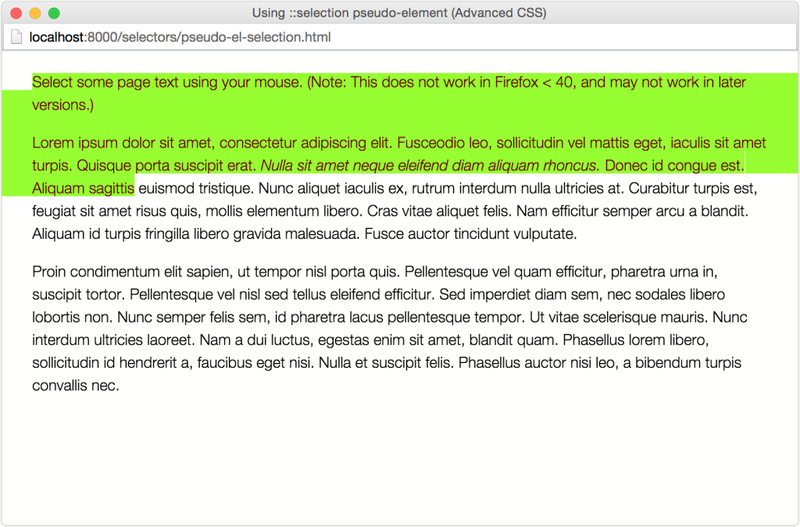 Currently, only one pseudo-element is allowed per selector. This means that a selector such as p::first-line::before is invalid. While the ::before and ::after pseudo-elements inject content, ::first-letter works with content that exists as part of the document source. With it, we can create initial or drop-capital letter effects, as you might see in a magazine or book layout. An initial capital is an uppercase letter at the start of a text set in a larger font size than the rest of the body copy. A drop capital is similar to an initial capital, but is inset into the first paragraph by at least two lines. 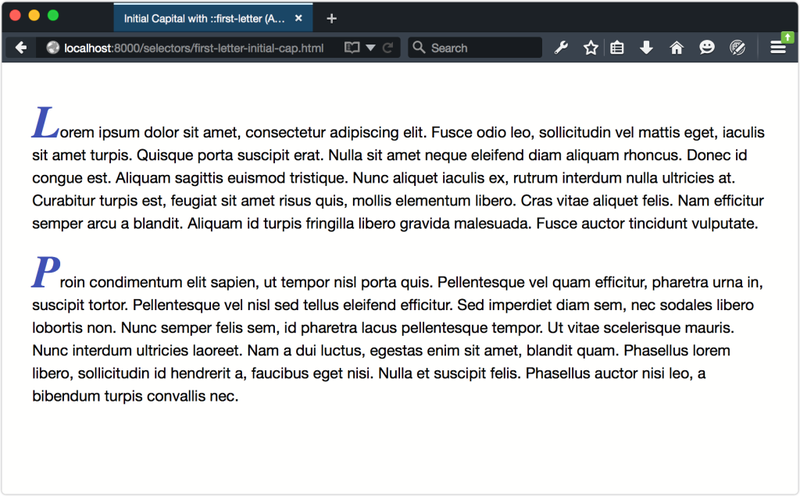 As you may have noticed from this screenshot, ::first–letter will affect the line-height of the first line if you’ve set a unitless line-height for the element. In this case, each p element inherits a line-height value of 1.5 from the body element. Decrease the value of line-height for the ::first–letter pseudo-element. A value of .5 seems to work most of the time. 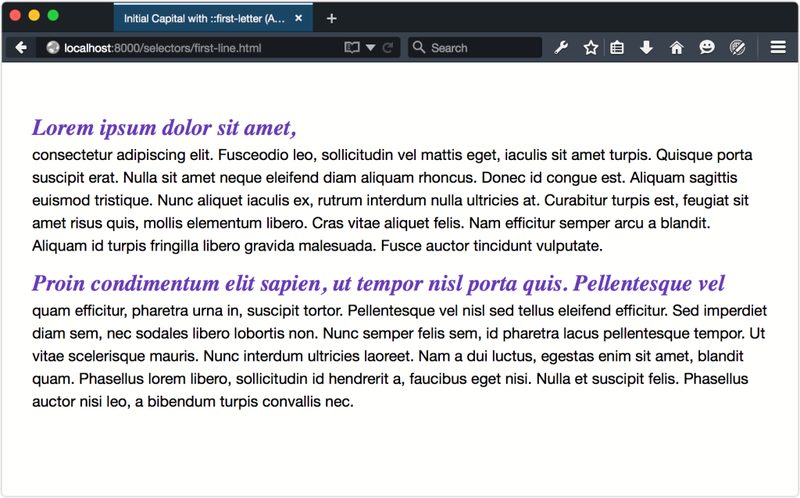 Set a line-height with units on the ::first–letter pseudo-element. Set a line-height with units on either the body or the ::first–letter parent. The first option preserves the vertical rhythm that comes with using unitless line-heights. The second option limits the side effects of using fixed line-heights just to those pseudo-elements. Option three is the worst of these options because there’s a high likelihood that you’ll create a side effect that requires more CSS to override it. This change produces the result shown below. Notice here that we also had to adjust the bottom margin of each p element to compensate for the reduced line-height of p::first-letter. Floating an element, or in this case a pseudo-element, causes the remaining text to flow around it, as illustrated below. Be aware that ::first-letter can be difficult to style with pixel-perfect accuracy across browsers, unless you use px or rem units for size, margin, and line height. In this case, the styles defined for ::first-letter will affect both the opening punctuation mark and the first letter, as presented below. All browsers handle this in the same way. Current browsers typically render the q element with language-appropriate quotation marks before and after the enclosed text; however, not all browsers treat those quotation marks the same way. In Firefox 42 (shown below), Safari 8, and earlier versions, ::first-letter only affects the opening quotation mark. In Chrome, Opera, and Yandex, neither the opening quotation mark for q nor the first letter of the paragraph are restyled. The figure below shows how this looks like in Chrome. Internet Explorer, however, applies first-letter styles to both the opening quotation mark and the first letter of the paragraph, as shown below. According to the CSS Pseudo-elements Module Level 4 specification, punctuation that immediately precedes or succeeds the first letter or character should be included; however, the specification is unclear about whether this also applies to generated punctuation. 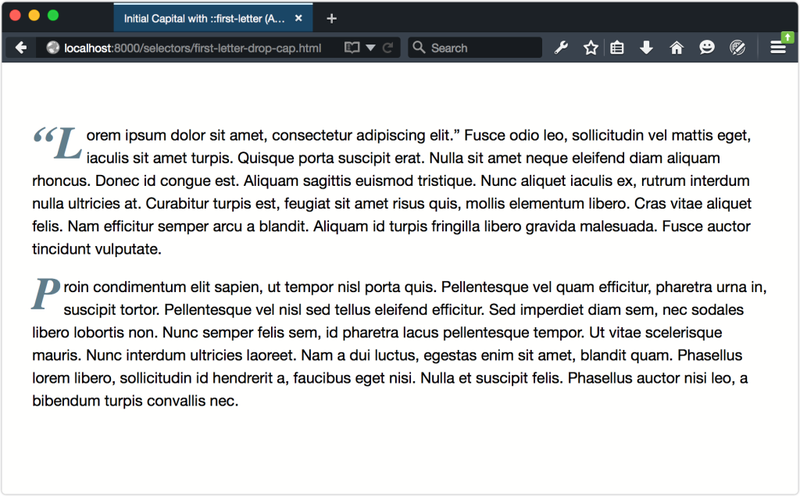 For the most part, ::first-letter works as expected across browsers. As with any CSS feature, there are some edge cases and browser bugs of which to be aware. This is true whether the first character is set using ::before and the content property, or included in the document source. There is no fix for this. You’ll need to avoid using these characters as the first character if you’re also using ::first-letter. Some versions of Blink-based browsers will not apply ::first–letter rules if the parent element has a display value of inline or table. This bug exists in Chrome 42, Opera 29, and Yandex 15. It’s fixed in Chrome 44, however, which should be released by the time this book reaches your hands. If you need to work around this bug, the easiest fix is to add display: inline-block, display: block, or display: table-cell to the parent element. You can see the result below. Notice that the first line of each paragraph is affected, rather than the first sentence. 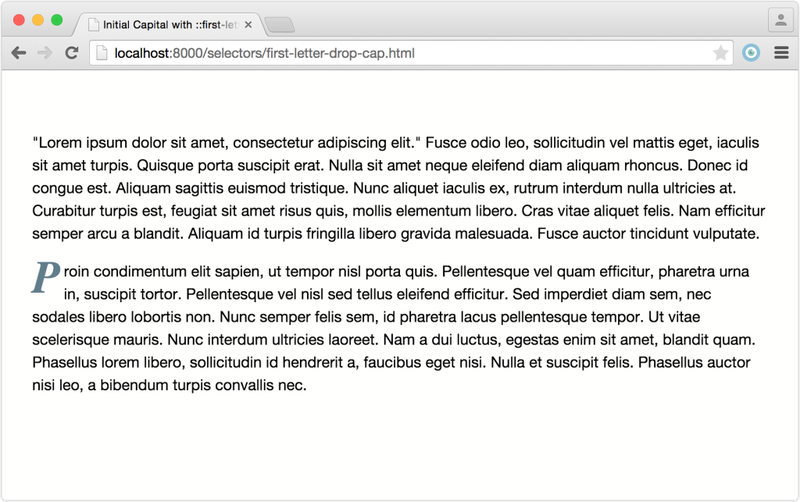 How many characters fit on this first line is determined by font size and element width. It is possible to force the end of a first line by using a br or hr element, as shown below. Unfortunately, this is far from perfect. 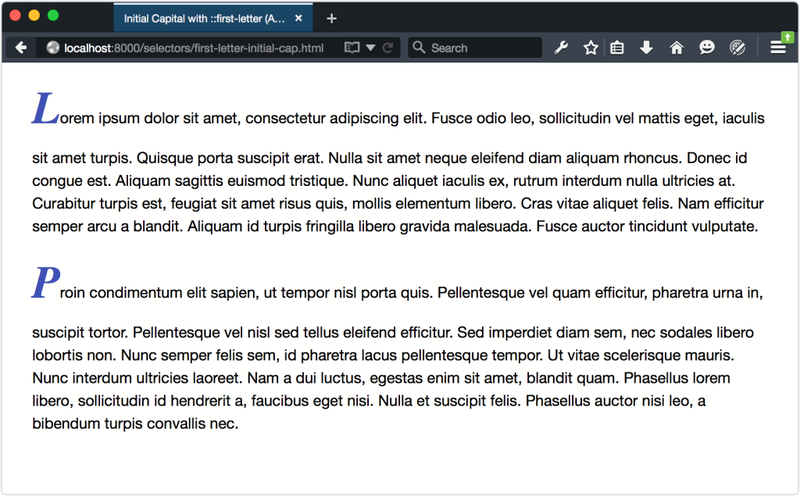 If your element is only wide enough to accommodate 72 characters, adding a <br> tag after the 80th character won’t affect the ::first-line pseudo-element. You’ll end up with an oddly placed line break. Similarly, using a non-breaking space (&nbsp;) to prevent a line-break between words won’t affect ::first-line. Instead, the word that sits before &nbsp; will be forced on to the same line as the text that comes after it. 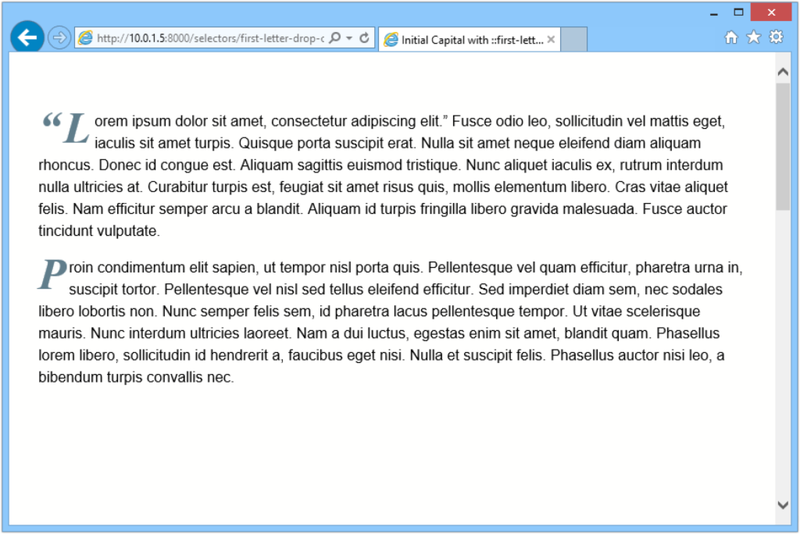 Generated content that’s added using ::before will become part of the first line, as shown below. Unfortunately, this is yet to work in Firefox version 40 or earlier. Firefox ignores the rule set completely. The ::selection pseudo-element is one of the so-called “highlight pseudo-elements” defined by CSS Pseudo-Elements Module Level 4. 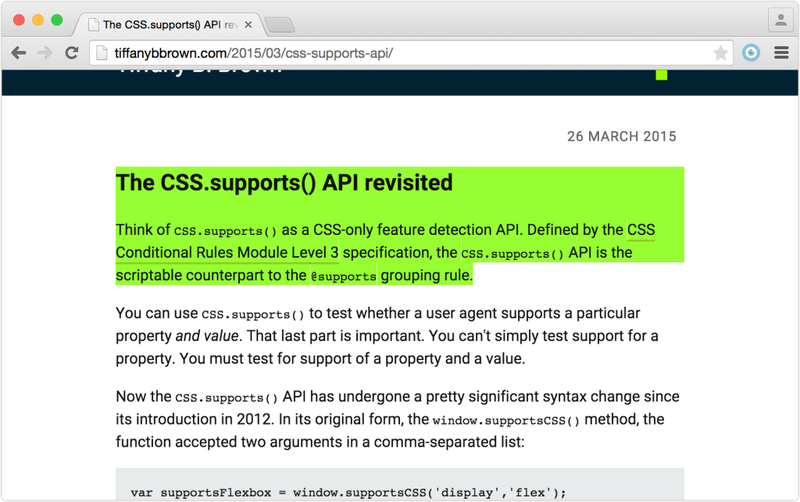 Formerly part of the Selectors Level 3 specification, it’s the only highlight pseudo-element implemented by browsers. With ::selection, we can apply CSS styles to content that users have highlighted with their mouse. By default, the background and text color of highlighted content is determined by system settings; however, developers can change what that highlight looks like, as indicated below. This CSS adds a lime green background to any element the user highlights, and changes the text color to a deep red. The example works in every browser that supports ::selection, and you can see the effect below. When selecting foreground and background colors to use with ::selection, keep accessibility in mind. Some color combinations fail to generate enough contrast to be read by low-vision users. Other color combinations may be illegible for color-blind users. Be sure to use a contrast checker and color-blindness simulator before selecting your final colors. The ::spelling-error and ::grammar-error pseudo-classes are also defined by the Pseudo-Elements Module. When implemented, these pseudo-classes will let us style text that is misspelled or ungrammatical according to the browser’s dictionary. The Mozilla Developer Network entry for line-height explains why unitless values are the way to go. The specification actually uses the phrase “typographic letter unit.” This includes Unicode letters and numbers, but also characters used in East Asian and Middle Eastern writing systems. In Firefox, this pseudo-element requires a –moz- prefix, like so ::-moz-selection.